At 5.30 AM, October 10th, I sat in the reception of the Sundown Ranch Hotel and waited to be picked up. 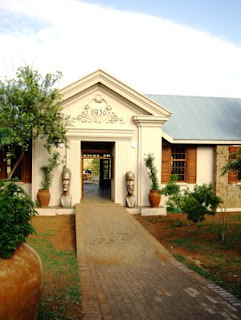 Destination - Pilanesberg National Park. Mission - morning safari. State of mind - extremely excited!! During these four hours I saw most of the animals of Africa as the sun went up over the savanna. We were picked up by a charming man with a strong Afrikaans accent. We sat in an open bus, giving us a good view. Beware - yes you are in Africa, but dress well if you visit during the South African spring. These mornings were extremely chilly, and I had a serious chill during the first hours of our safari. We were only two from Sundown Ranch, and we drove through the gates of Sun City and here more guests entered. Our ranger gave us some precautions and then we were ready to enter the wilderness. And here is what we saw. This blurred picture of distant monkeys was sadly the only encounter I had of these our distant cousin during my whole stay. 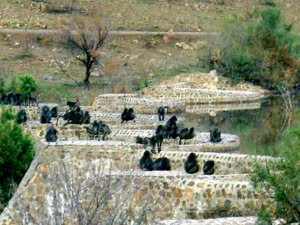 They had spent the night on the top of this small dam. Here they could protect themselves against birds and animals of prey. They were still rural dwellers. Many of their cousins had moved and enjoyed the urban living offered by Sun City. Suddenly the car stopped, as a very small antelope jumped up along the bus and ran away. I managed to take this snapshot. I do not remember what the ranger called it, but I have made some research, and it may be a Common Duiker antelope. These species are among the smallest antelopes to be found. 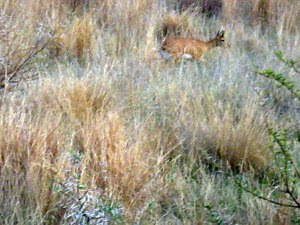 Then we saw three Springboks playing by our car. 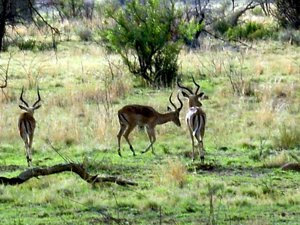 This beautiful brown and white gazelles with their beautiful horns. They used to be found in large numbers in most of the Southern Africa. 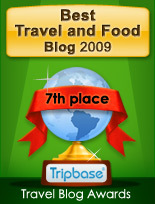 The numbers did however diminish due to hunting. Now they are found in growing numbers due to conservation by e.g. the South African government. And then we saw our first large mammal. The black Rhinoceros. There are several species of Rhinoceros, and the black and the white are the main ones in Africa. The black and white are misleading, as colours go on these majestic mammals. 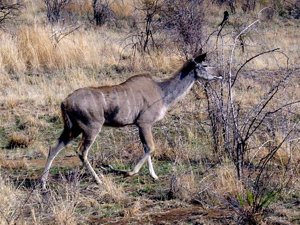 They are very similar in colour, and white are probably derived from "wide" in Afrikaans. 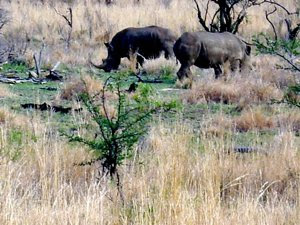 The black are, luckily, the less aggressive of the two, shown here as they grazed on several locations along our route. We stopped the bus, and the ranger asked us to look up into one of the nearby trees. 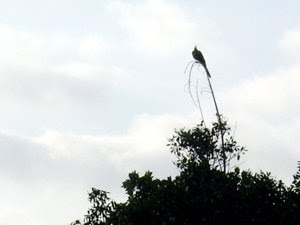 There we saw the silhouette of a bird. He explained that it was a bird whose cries would alert prey, if a cat of any kind would be close to hunt. O Joy! Then I saw my first giraffe of many along our way. There were at least two varieties, one darker and one lighter one. The difference of colour are caused by their original habitat. As giraffes were never a part of the natural fauna in the park, they were transported from different areas. The lighter variety came from drier conditions, whereas the darker (image) came from more densely forested areas. I was thrilled to see these animals grazing local trees. 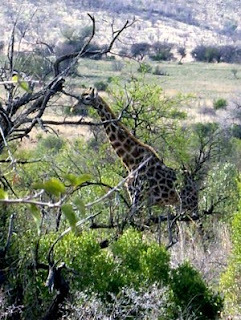 In fact many trees was not seriously affected by giraffes, as they were allowed to eat for a very short time. As they started to eat, the trees would excrete an uncomfortable smell, making the giraffe to stop, thus saving some of its foliage to allow regrowth. After around two hours we were allowed off to enjoy some refreshment and visit other vital facilities. In the middle of the park we came to this beautiful building where you could buy hot dogs, biltong, potato chips and much more, and get some coffee, soft drinks or beer. This was a haven not only for people but also for birds that ate food wasted or left behind by the stream of safari guests enjoying the park by bus or in their own car. Then, we proceeded to see more of the wild animals of South Africa. 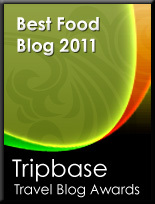 Wildebeest or Gnu, if you will! We saw many herds of Wildebeests roaming far away from the car, but they got closer, and we got an increasingly better look. 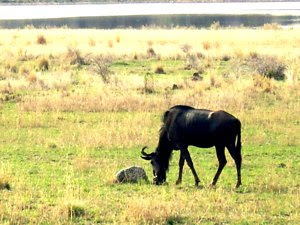 Here a Wildebeest graze between us and a large lake, where we could see other antelopes in the distance. Mind - Zebras on the road! Suddenly we stopped. Not because we saw something along the road, rather on it. 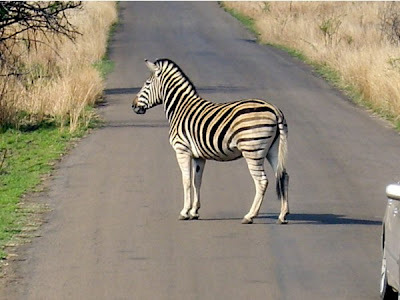 Two zebras were either resting along the road, and one did its best to stop the traffic. It just stood there, clearly unaffected by the fact that people left their cars and started to take pictures. After a short stop, the zebra reluctantly left the road, walking into the dry grasslands. Then we stopped to see a tree. Many of you have probably enjoyed the delicious Amarula Cream, the creamy liquor made from the fruits of the Marula tree. 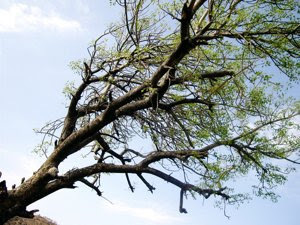 Well this is where this great drink comes from - the Marula tree, growing along our way. 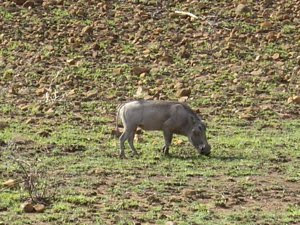 Then we saw the first, and only pigs - the funny warthogs with large tusks. A group of two or three were by the road, nearly at the end of our safari. Is this an Eland? 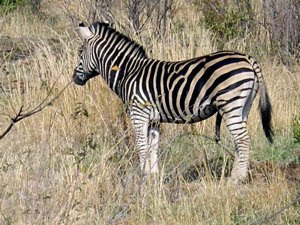 It was a large animal, with a hump, and with stripes over the body. The biggest problem was its horns, or rather the lack of them. Still it was a wonderful animal that leapt over the road and entered the grasslands, and we were not considered any danger. 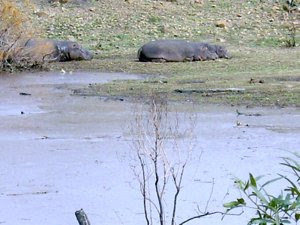 Here is the most dangerous we met of our trip, the River Horse - the Hippopotamus, resting in the morning sun. Resting, lucky for us, as you should never be fooled but their apparent clumsiness. These animals may outrun anyone and kill you with one large bite with their gigantic jaws. And then we left the Pilanesberg, sadly having not seen any lions or elephants. I will leave you with a short film clip from our trip. And visit Pilanesberg National Park. 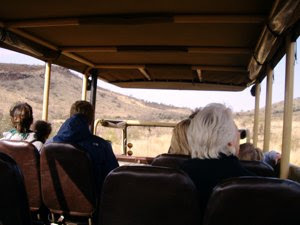 The fact that we saw so many different animals one early morning may indicate that here you get your money back when going on safari.